1v1 dribbling drill, multiple goals is a great dribbling warm-up drill that focuses on beating an opponent and evading a defender. Create a small circle about 5 yrds and set 7-8 gates about 10-15 yards from the edge of the small circle around the parameter. Split the team into two even teams with one team wearing alternate jerseys. Each member should partner up with a player on the opposite team. One team will starts inside the small circle in the middle of the gates. This team will be the team focusing on dribbling, so each player will need a ball. The other team will start outside the small circle in front of their partner. On the coaches command the dribbling player will attempt to evade their opponent and dribble (not pass or shoot) between one of the gates. The defender attempts to stop the dribble and the play the ball past the parameter of gates. 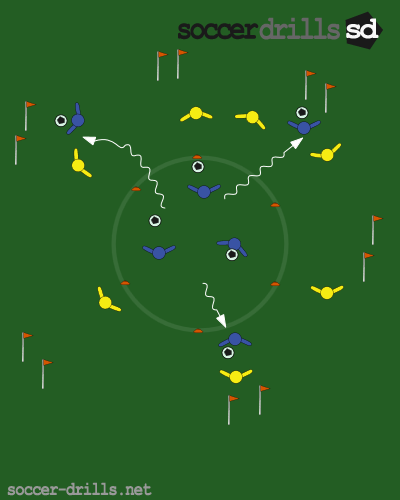 If the dribbler is able to dribble between one of the gates, the dribbler is awarded a point. Switch the players role after each attempt and let the defenders be on the attack and and the attackers be on deffense. The 1st player to reach 10 wins.